A 1031 Exchange, or Like-kind Exchange, is a strategy in which a real estate investor can defer both capital gains tax and depreciation recapture tax upon the sale of a property and use that money, which has not been taxed, to purchase a like-kind property. Important Note: This material has been prepared for informational purposes only, and is not intended to provide, and should not be relied on for, tax, legal or accounting advice. You should consult your own tax, legal and accounting advisors before engaging in any transaction. 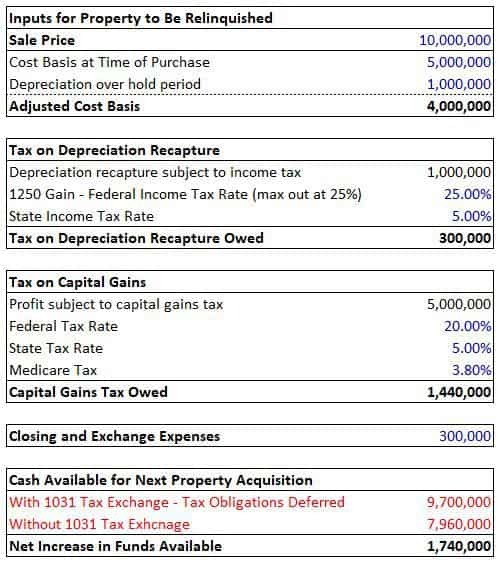 Using a 1031 Exchange allows a real estate investor to have significantly more equity available to purchase a desired property; through disposing of a real estate asset and deferring taxes, the exchanger (as we will be referring to them) has the entirety of the proceeds of a sale with no taxes taken out less expenses to use in the purchase of a new property. There is one way that I am aware of where a person can escape paying these taxes at a future date and as a result, many people use this advantage as a way of estate planning. If you die, and the real estate is passed on, the depreciated basis is effectively wiped away and the building is revalued at today’s fair market value. This is referred to as a stepped up basis. This effectively means the entity that has inherited the property is not responsible for the taxes due on the recapture of the depreciation or capital gains and the cost basis is reset to the market value at the time of the transaction. Mr. Smith bought a property with an initial cost basis of $5 million dollars. Many years later, Mr. Smith dies and his daughter inherits the property, which now has an adjusted cost basis of $2.5 million and a fair market value of $10 million. If Mr. Smith’s daughter was to sell that building with no stepped up basis rule in effect, she would essentially have to pay depreciation recapture tax on $2.5 million ($5 million less the adjusted cost basis of $2.5 million) and capital gains tax on $5 million ($10 million of sale price less $5 million o original purchase price). However, with the stepped up basis rule, the cost basis is now $10 million, which means there is now no gain on the sale in the eyes of the IRS. She can now sell the building at $10 million and essentially pay no capital gains or depreciation recapture tax! WHAT QUALIFIES PROPERTIES TO BE ‘LIKE-KIND’? According to the IRS, both properties must be held for use in a trade or business or for investment. These properties do not need to be the same in size, value, or asset type. Personal residences cannot be considered for a 1031 exchange. Property within the United States is not like-kind with property outside the United States. Essentially, an office building can be exchanged for land, a shopping center for a self storage facility, etc.. In order to qualify for a 1031 Exchange, a seller of real estate must successfully sell their property, and within a certain amount of time, identify and purchase another property or properties with the funds from the sale. There are strict rules to follow and any deviation may negate ones ability to successfully take advantage of a 1031 Exchange. These time parameters must be followed exactly. There is no allowable extension of time unless there is a presidentially declared disaster. Upon the day of sale, the exchanger will have exactly 45 days to identify other properties and notify the potential seller of the intent to purchase. To officially identify a property, the exchanger must notify the potential seller in writing and clearly describe the property of interest with the address, description of the property, and name (if applicable). The exchanger must also sign this document. Upon whichever is earlier of (1) the day of sale OR , (2) the income tax return due date for the year in which the property was sold; the entity seeking a 1031 exchange will have exactly 180 days to complete the acquisition of the next property, or properties, and this property must be similar to those identified during the 45 day window. 3 Property Rule – The replacement properties identified are 3 or less. 200% Rule – The replacement properties can be an unlimited number of replacement properties as long as the aggregate fair market value of all properties identified is less than 200% of the value of the disposed property. 95% Rule – The replacement properties can be an unlimited number of properties as long as the final properties acquired are equal to at least 95% of the properties initially identified. Every 1031 Exchange needs a Qualified Intermediary (“QI”). A Qualified Intermediary is not a regulated term and needs to be chosen by the exchanger and be someone he or she can trust to both get the job done and securely manage the process. There must be an agreement in writing between the exchanger and QI before the closing of the property being relinquished in the exchange. The concept is that at no point should the exchanger be in receipt of funds from the sale and therefore should be removed from the direct transactional parts of the exchange until things have been wrapped up. The IRS’ view is that since our exchanger is never actually cashing out on the investment in the ownership of real estate, there is no taxable event, and if the exchanger ever comes into possession of the proceeds it is as if he or she sold the property and the 1031 exchange is no longer an option. A qualified intermediary essentially acquires the relinquished property from the exchanger, sells it to a new buyer, uses the proceeds from the sale to purchase the replacement properties on behalf of the exchanger and then transfers the properties back to the exchanger. However, the QI, at no point, is the owner of any of the properties. Yourself or your real estate agent or broker, investment banker or broker, accountant, attorney, employee or anyone who has worked for you in those capacities within the previous two years. WILL THE 1031 EXCHANGE BE AROUND FOREVER? The fate of the 1031 Exchange in the long term is anyone’s guess. Congress has the authority to abolish the tax break at any time and there have been discussions about doing so over the past decade or so. However, the 1031 Exchange, which has been around since 1921, has survived the recent tax overhaul and appears to be secure in the near term. To make this model accessible to everyone, it is offered on a “Pay What You’re Able” basis with no minimum (enter $0 if you’d like) or maximum (your support helps keep the content coming – typical real estate models sell for $100 – $300 each). Just enter a price together with an email address to send the download link to, and then click ‘Continue’. If you have any questions about our “Pay What You’re Able” program or why we offer our models on this basis, please reach out to either Mike or Spencer. Note (especially for Gmail users): The model is sent via email and occasionally is blocked by spam filters. If you don’t see the email arrive within five minutes, check your spam folder. About the Author: Michael Belasco has seven years of real estate and construction experience. He currently works for a global real estate investment, development, and asset management firm in San Francisco managing large scale development projects in the city. Michael has both an MBA and Master in Real Estate with a concentration in Real Estate Finance from Cornell University.